When it comes to breads, I’d always have a bias for crusty breads to the spongy soft ones. Not that I don’t like the latter of course. Just that to me, the hearty and somewhat earthy qualities, together with the robust textures of a rustic bread have some kinda appeal which soft loaves lack. Its like an entirely different animal together. And of course, the major plus point for a soup and stew lover like me, is how well these breads go with the liquids, lapping up the flavours with ease and soaking in all the goodness with great relish! 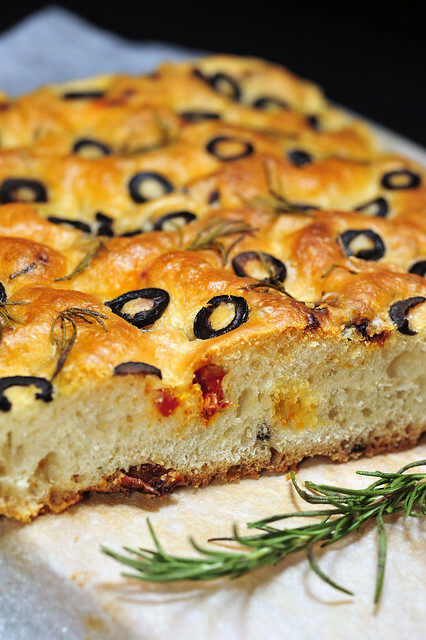 Focaccia is one of those rustic breads which has so much character on its own, exuding the heady perfumes of rosemary and garlic infused olive oil. And what more, its a simple and fuss-free bread to make. And here’s a very forgiving recipe for all who are interested to try!